As I write this, we are living aboard Thyme Hyssop & Wry on the hard in the boatyard, preparing to launch on Monday. My heart is not here this season. I am so very torn. This past fall was the best of times and the worst of times for the Schneider family. 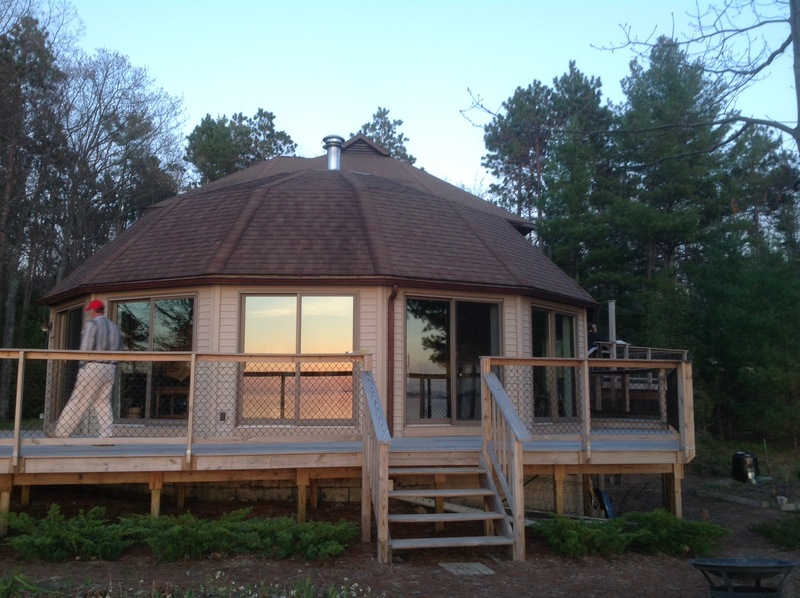 My parents are downsizing and selling their very large home on Grand Traverse Bay, “our family’s gathering place.” The cottage, “the round house” was designed and built by my dad in the 1970’s. It’s where I spent summers in my teen years; my younger siblings grew up there summers. It’s an incredibly special place and our family will mourn its loss once it’s sold. But the memories will never leave us, and for that we are very grateful. And the downsizing sales (we’ve done two), though much work, were fun–working together as a family, telling our stories, reliving memories. The round house, designed by my dad. It’s a modified geodesic dome, and its 14 panels and roof were built by my dad in our garage in Grand Rapids. They fit together perfectly when the last panel was inserted! My sister, Amy, was born on my 4th birthday. We may both be Capricorns, but we are very different women with different strengths. Gives a lot of credence to the Chinese year thing! However, we had such fun working the “round house” sales together. We make an excellent team. In early November, a CT scan showed a mass on her pancreas. An MRI, then an EUS confirmed the pancreatic cancer diagnosis. Shock does not begin to describe our reaction. My sister is an amazing person. She is a project manager, so is about as detail-oriented and organized as they come. She likes to be in control. Giving your life over to others right now is so very hard, but her main job right now is to fight the cancer. Medical doctors, nurses, technicians are more or less in control of her life and routine right now. She is currently undergoing chemotherapy, shrinking the tumor and destroying any errant cancer cells traveling in her body. After chemo ends (mid February? ), she will do radiation therapy, targeting the tumor. And then, doctors hope to do surgery, removing what is left of the tumor after chemo and radiation. The chemo, so far, has been brutal. It is scheduled every two weeks. She arrives at the cancer center at 8:15 AM and receives infusion of two different chemo drugs. The infusion of those two drugs finishes up mid-afternoon. And then they “hook her up” to a fanny pack that continues to infuse her over the next 45 or so hours. She usually arrives home around 4:00 PM on “chemo day.” It’s a long day and it wipes her out. Even driving home is exhausting. There are all manner of different side effects she is experiencing, but the exhaustion is astounding. I remember exhaustion and total lack of any energy following a major surgery several years ago, but I quickly bounced back. Amy doesn’t “bounce back.” And just as she begins to feel a bit better, she is “zapped” again. Her life is “on hold” as she battles to save it. And here I am. In Florida. As my sister fights the battle of her life in cold and icy Michigan. Sending our hopes and prayers for the best outcome! My heart and best hopes go out to your sister and your whole family (including you!). Your sister is doing a very aggressive chemo regime – her medical team is really going after this cancer hammer and tongs. On a two week schedule, her body probably is not able to get completely back to where it was (in the bone marrow, etc.) at the beginning of the treatment before it gets hit again. I will be thinking of her. And you. Side note: I had a similar shock 7 months ago when I found out I have stage 4 lung cancer. So far so good, a miraculous drug is keeping the cancer at bay. I’m living my life one good day at a time. Three websites I want to recommend to your sister (and you): smartpatients.com, inspire.com and cancergrace.org. For me, spending a lot of time reading about cancer does not make me feel super good, I need to poke at the edges, but these are great places to poke in the company of others dealing with cancer. They also have lots and lots of good info on current research, trials, mitigating side effects, etc. I certainly understand your torn feelings — siblings are such precious people, and watching them suffer and struggle against cancer is heart rending. My thoughts and prayers are with you, and all the members of your family.